If you missed the live stream last Wednesday (25 July, the traditional opening day of the Bayreuther Festspiele), through the magic of VPN you can still view a recording of the complete performance on BR-Klassik here. Apparently it’s still available to view until 31 December. This staging by Yuval Sharon is a genuinely historic production. This is the first time an American has directed at Bayreuth. It also marks the achievement of a complete “cycle”: Christian Thielemann, 59, has now conducted all ten canonical Wagner operas at Bayreuth. And one of the production’s especially powerful elements is the portrayal of Ortrud — Wagner’s most fascinating villain? — in her return to the Green Hill after a long hiatus. [Sharon] is the closest thing that American opera has to a genuine avant-gardist. … This is a story, in the director’s mind, not about Elsa’s tragic failure to keep her faith, but about Lohengrin’s unreasonable demands, about the hypocrisy of his — and, therefore, modernity’s — inability to live up to his own vision for society. And who will make that hypocrisy clear, challenge it, overcome it? The women. Doch dass die offenbar tiefschürfend reflektierte, mit allerlei Romantik und Farbensymbolik angereicherte Szenerie und das über weite Strecken biedere, ermüdend oft auf die Zentralperspektive fixierte Stehtheater im weiten Bühnenrund sinnstiftend (und nicht bloss illustrierend) ineinandergriffen – davon kann auch hier keine Rede sein. The indispensable perlentaucher.de rounds up some of the German critical press here. The 2016 edition of the Bayreuth Festival began today with a new production of Parsifal, staged by Uwe Eric Laufenberg (Intendant of the Hessisches Staatstheater Wiesbaden) and conducted by Hartmut Haenchen (following the controversial withdrawal of Andris Nelsons). This piece basically focuses on the religion of Christianity. On one hand, the grail knights in “Parsifal” inhabit a realm of charity, empathy and sympathy, and they come to the aid of the needy. Then there’s the other side: a crucified God, blood rituals and military symbolism. I believe that Wagner wanted to bring out the factors of benevolence and mystery in this work. Not to openly criticize religion, but to enable one to experience it. That’s interesting in our own times of widespread religious fundamentalism – but also in times of a Pope Francis, who has been de-emphasizing the institutional side of the Catholic Church and stressing the factors of mercy, grace and benevolence. It’s always been pertinent to ask: What are religions doing, and are they allowing themselves to be abused for ideological purposes? What do they really stand for? BR-KLASSIK: Sie haben in einem Gespräch in Bezug auf “Parsifal” gesagt: Man muss erzählen und nicht zelebrieren. Was heißt es konkret? Hartmut Haenchen: Wagner hat das Werk ja auch nicht “Oper” genannt – aus gutem Grund. Die Handlung des Stückes ist vor allem im ersten Akt beschränkt. Es wird erst Mal 45 Minuten lang erzählt. Und wenn ich das zelebriere, dass die Texte auseinander fallen, dass man die Textzusammenhänge nicht mehr verstehen kann, weil man Tempi wählt, die Textverständlichkeit unmöglich machen – dann wird es zelebriert, aber nicht erzählt. Und ich lege großen Wert drauf – und da stützte ich mich natürlich auf die Quellen – dass die Geschichte erzählt werden muss. “Der Fluss der Sprache bestimmt das Tempo”, – das hat Wagner selbst gesagt. Und dem muss man sich grundsätzlich unterordnen. Wolfram von Eschenbach wrote an epic on “Parsifal.” It was inartistic, but it sufficed for his time; for there were in those days men who had a measure of clairvoyance and could accordingly understand Wolfram. In the Nineteenth Century it was not possible to make clear to man the deep meaning of that great process of initiation in a drama. There is, however, a medium through which man’s understanding can be reached, even without words, without concepts or ideas. This medium is music. Wagner’s music holds within it all the truths that are contained in the Parsifal story. It’s no coincidence that the technologically forward-looking Opus Arte — an early adopter of the high-definition DVD and Blu-ray formats — here documents the current Bayreuth “Ring” via good old-fashioned CDs. In fact, this set marks the company’s first foray into the CD market. The stage direction by octogenarian German playwright (and opera novice) Tankred Dorst, which revolves around the idea of the modern and mythological worlds coexisting in parallel universes, has gained few fans since the production was unveiled in 2006. 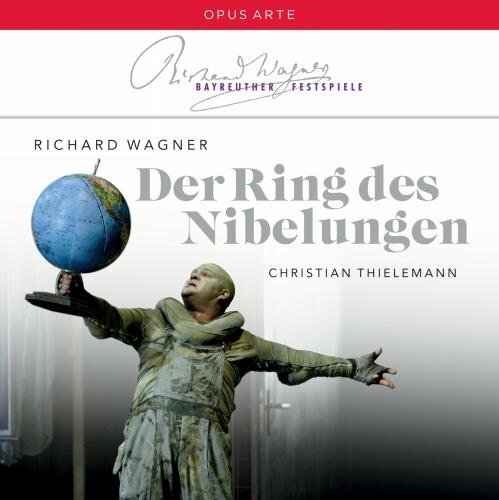 Instead, the real buzz around this “Ring” has focused on what Thielemann and the orchestra accomplish.